Together with the organization Voice of the Animals on December 4 we organized the first big anti-hunting demo in Croatia. 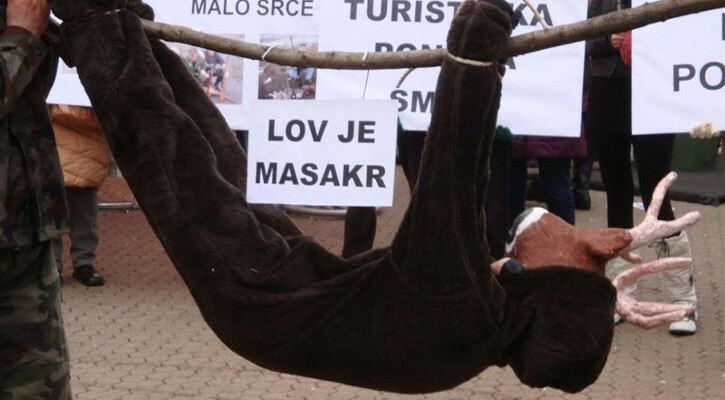 Protesters marched through the center of Zagreb, while on the main square we held an interesting ‘hunting’ performance. The photo gallery from the protest can be viewed here. With the invitation to the tasting of vegan stuffed cabbage rolls, roast, Russian salad, steaks, and desserts with no ingredients of animal origin, which took place on December 23 in Varsavska ulica in the center of Zagreb, we reminded our fellow townsmen of the true message of compassion, peace and non-violence during the seasonal holidays. Everyone who visited our table received recipes for holiday dishes. Publishing the horrible statistic of animal abuse in Croatia in 2010 in which we mentioned only some of the numerous cases of breaking the law, we announced a protest for the implementation of the Animal Protection Act. The protest will take place on Saturday, January 15, 2011 in Zagreb at 11 A.M.
We invite you to think about your New Year’s resolution. Let it be a compassionate resolution which will help animals. There are lots of ways for you to directly positively influence other people and contrinute to the creation of a better world. One small resolution can make big changes. – We sent requests to the Croatian Veterinary Chamber for the correction of dog and cat vaccination price, the correction of dog and cat castration price and the correction of dog and cat microchipping price. – To the County Attorney in Sisak we sent a criminal complaint due to heavy negligence by the owners of horses and cattle in Lonjsko polje. – On December 8 in our office the workshop on finance-management of associations was held by Mladen Djurkinjak from the Center from Civic initiatives. Furthermore, our representatives took part in Volunteer meetings on December 15, where the Volunteer Oscar was given to best volunteers, while our other representative participated at the meeting of the Grundtvig partnership at the Vegetarian Society in Manchester. – On December 11 we organized a another socializing in our office for vegetarian children and parents. Mirna Trumbetas, a nutritionist from the association Nutrivita was also present. – On this year’s 4th Festival of Creativity and D.I.Y. culture in the Student Center in Zagreb our activist Mariana Cerovecki was also present with her artworks which promote animal rights. All food on the festival was vegan. – We invited everyone to compassionate shopping by choosing a gift for their beloved which will help animals or at least avoid being part of animal cruelty. – From the news on our site we invite you to check our Health Food Stores section where we now have the brand Alter Natura, also see new links in our Links section like Tom’s Universe Place, HAYTAP – Hayvan Haklari Federasyonu, Vita or VEG facile. – Please appeal to your acquaintances not to use pyrotechnics while celebrating New Year as it disturbs and scares wild and companion animals. Because of their sensitive hearing, they can also become deaf. Wishing you a peaceful, safe and positive entry in the new year we invite you to stay with us and support our work and efforts in 2011 as well. As always, you can support us by becoming our member or with your kind donation, by proofreading the English section of our website, or by ordering our merchandize from our web catalog if you live in Croatia.